Ever since we began our marathon travels in 2006 Jim has had his eye on the various Amsterdam to Budapest river cruises. We've seen many different varieties of these, but something else has always taken precedence. As part of our 2016 Provence adventure, we spent three days on the Rhone River in a riverboat and didn't really enjoy it much, but in 2017 Road Scholar offered a new version of the Amsterdam-Budapest cruise on a brand-new river ship: the Crystal Mahler. This excursion involved many fewer people than were on the Rhone boat, er, ship, and a larger ship to boot. Jim carefully reviewed the sizes and floorplans of the rooms and we decided to give it a whirl. Friends wondered at our choice of taking a river cruise in November -- the days are short, the weather is normally chilly and rainy -- but there are MANY fewer tourists at popular sites! Besides we are used to traveling in the winter. The days weren't that much shorter than we experience in Virginia at this time of year. As for the weather, it was all over the place: sun, rain, sleet, snow. Thankfully not windy. A comment on spelling. 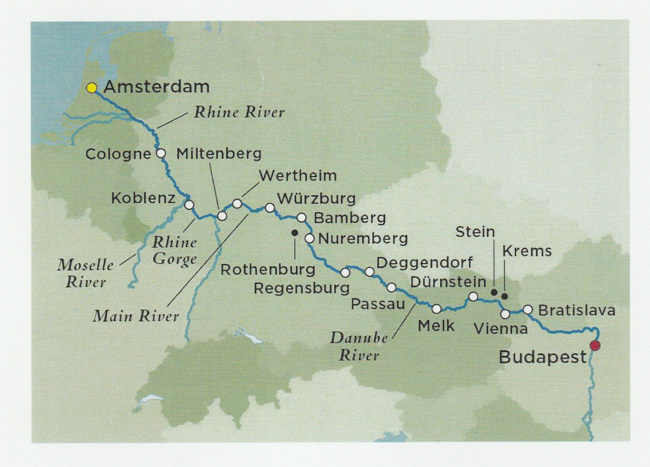 During my studies in Germany I learned the spelling Rhein rather than Rhine. After making an effort to use Rhine, I've regressed to the German spelling. In Dutch, by the way, it's spelled Rijn. All of these are pronounced the same way. There are a couple of ways to follow us on our trip. I've tried to make the narrative a complete summary, but I've used many links to other web sites to provide additional details and sometimes pictures. You can either stick with the basic narrative or explore the various links. At the time this album was created the links were all valid, but the WWW is in constant flux and that can change. If you encounter broken links, please send us some email. You will note that many of the links are to articles in Wikipedia. Regardless of what you think about that source, the benefit is that links rarely disappear and you're not bombarded with ads. This is not the case with touristic and university sites that are constantly, it seems, being reorganized, or often funded with annoying ads. Check out the quick overview or follow us day-by-day using the links below.